“You won’t get an easy recipe that can be applied here and now. 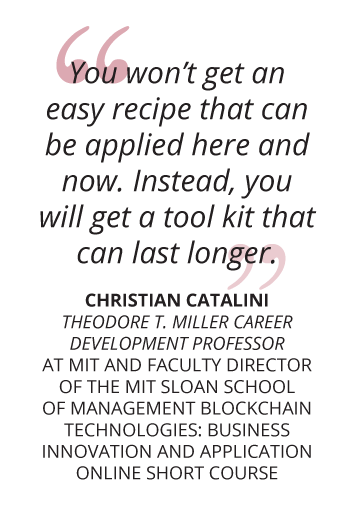 Instead, you will get a tool kit that can last longer – a method for decomposing problems as they emerge, and an understanding of the key fundamentals of the technology so you can take advantage of them,” says Christian Catalini, Theodore T. Miller Career Development Professor at MIT and Faculty Director of the MIT Sloan Blockchain Technologies: Business Innovation and Application online program. Blockchain technology holds the potential to enable widespread, transformational and powerful change. You can look forward to gaining a deep understanding of blockchain technology from industry experts and MIT Sloan faculty, as well as an understanding of how this emerging technology can be used to verify the attributes of a transaction, at a much lower cost. Below are four more things you can look forward to when studying the MIT Sloan Blockchain Technologies: Business Innovation and Application online program. 1) Exploring bootstrapping network effects through blockchain technology and cryptoeconomics. Blockchain technology has the potential to bootstrap and facilitate a marketplace without traditional intermediaries. The program will give you the means to understand how blockchain technology reduces the cost of networking, and recognize the implications this has for market structure and changes to the nature of intermediation. 2) Proposing a blockchain-based solution to address a business problem within your own context. A key takeaway of this program is the opportunity to propose a blockchain-based solution to a business problem within your own context or organization. In doing so, you’ll be empowered to discover opportunities for innovation and efficiency using blockchain technology in your own capacity. 3) Investigate the effects of blockchain technology on the digital agenda. Blockchain technology brings with it the possibility of interacting with broader changes on digital platforms, with artificial intelligence, and the internet of things. It also carries implications for the entire digital agenda of a company, including digital privacy. You’ll discover how businesses use tokens and crypto-assets to raise funding and launch new types of digital platforms. Noorddin Taj, Lead Architect at IT&S Architecture in the USA says he is most looking forward to extending his skill sets in “IT strategy, Architecture and M&A to add expertise in emerging technologies such as blockchain” and believes “the knowledge and skills I expect to gain through this program will provide opportunities for me to successfully contribute to my organization’s digital agenda”. 4) The opportunity to network with new professionals. The MIT Sloan Blockchain program offers you the rare opportunity to network with new professionals with similar interests and career paths, as well as those who come from different backgrounds. 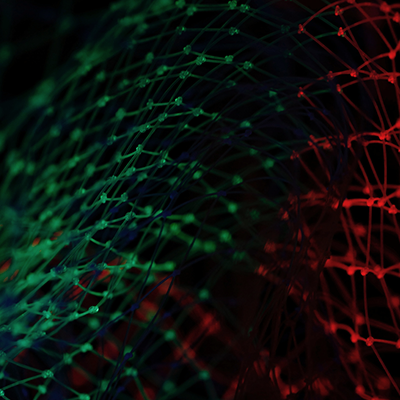 There is so much more to look forward to in the MIT Sloan School of Management Blockchain Technologies: Business Innovation and Application online short course.